Members of Main Street Center can access back issues of Main Street Now and Main Street News. Each of these publications features articles about how to approach sustainability and development from a Main Street perspective. Director Doug Loescher’s column focuses on the often-ignored economic and social aspects of development and provides simple, straightforward tips to improve sustainability. See how other Main Street communities throughout the United States have made sustainability work for them. 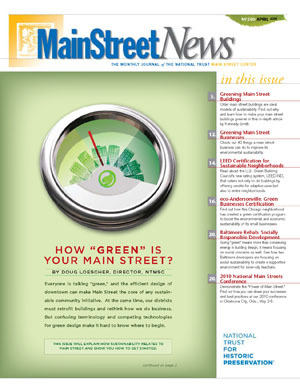 The March/April 2010 issue of Main Street Now features two green-building success stories from Main Street communities in Iowa—and describes how green-building initiatives helped create a sense of partnership among the businesses and the Main Street organization. Working with the National Trust Main Street Center, the Preservation Green Lab, based in Seattle, is driving green-building research in key locations throughout the United States. Read up on their projects, their research, and how you can implement their strategies to create jobs in your community.